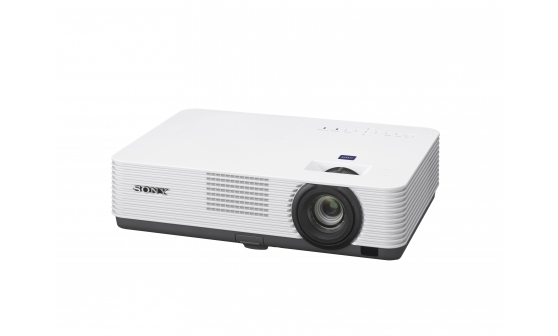 The VPL-DX271 XGA projector is a cost-effective yet fully-featured choice for clear, bright presentations in offices, smaller meeting rooms and school classrooms. Light, compact and energy efficient, it's easy to set up and connect with other devices. Powerful 3,600 lumens colour light output with 3LCD BrightEra™ panel technology ensures crisply detailed XGA resolution images that are always seen clearly, even in brightly-lit rooms. Easy connections are enhanced with dual HDMI ports, plus a 5V USB supply to power PC sticks and smart dongles. Auto Start gets you presenting faster, while Quick Power Off saves time when you're hurrying to the next meeting. Another presenter-friendly feature of presentation timer reminds speakers not to outstay their welcome.